Susanna (Imel) Knight was born in 1816 near Ursina, Somerset County, PA, the daughter of Jacob and Martha (Minerd) Imel. Susie died as a young mother, and her life story has been obscured by the misty haze of the past. Her husband, however, lived a long life, and is mentioned in Fannie Knight Geise's 1969 book, Knights to Remember, seen here, bearing a light green cover. When Susie was an infant, her father died. Her mother remarried within three years, to widower Leonard Harbaugh Sr. Susie was brought into this new family with eight stepbrothers and stepsisters. Susie's mother would go on to have five more babies, for a grand total of 14 children and stepchildren. Susie was assigned as her legal guardians Jacob Knable and Nicholas Knight to look after her legal and financial interests. Susie married James Knight Jr. (1814-1875), the "fourth son" of James and Catherine (King) Knight Sr. Throughout 1837 and 1838, James received $70 in installment payments from his wife's guardian "in part of her dowry... [and] legacy..."
The Knights lived near Ursina, and had five children -- Catherine Anne Younkin, Norman D. Knight, Martha J. Jennings, Daniel Harry Knight and Zalman Knight. Heartache rocked the family in about 1845, when Susie died in Somerset County, with her children all under the age of 10. The cause of Susie's death is unknown, as is her burial site. Afterward, James petitioned the Somerset County Court of Common Pleas to appoint his brother Daniel Knight as the children's guardian. In 1850, he also asked the court to award his children a share in the estate of their great-grandfather, Henry Imel. James married Hannah Harbaugh (1817-? ), daughter of Jacob and Sarah (Knable) Harbaugh of Mill Run, Fayette County, PA. Some time soonafter, the family relocated to Marshfield, Athens County, OH, where at least one of James' brothers also lived. Four of James' five children accompanied him, except Martha, who had married a Somerset County man and stayed behind. On May 26, 1851, James purchased an 80-acre tract of farmland in Lee Township, Athens County. He paid $800 for the land from the sellers, Joseph and Emily Clark. It was located in the northwest half of the northeast quarter of Section 18, Township 10, Range 15. Ten years later, on Aug. 3, 1861, James and Hannah sold a 2.5-acre parcel of their farm to son Daniel. During the Civil War, two sons (Norman and Daniel) and a son in law (John R. Jennings) served in the Union Army. All three returned home relatively unscathed. Tragedy rocked the family in March 1865, when son Zalmon accidentally shot and killed himself at home in Marshfield while preparing to shoot an owl. James and Hannah moved to Van Wert County, OH, where they resided on a farm in Liberty Township, near Ohio City. They had several children of their own -- Obiah Knight, Martha Knight, Susanna Llewellyn, Sarah Humrickhouse, Marion Knight, Jacob B. Knight and Mary Elizabeth Agler. James died of "sinking chills" in Van Wert County on Aug. 13, 1875, less than two weeks before his 61st birthday. 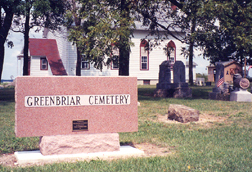 He was buried at Greenbrier Cemetery, seen here, just west of Ohio City. After his death, an inventory was taken of his "personal goods and chattels" by executor William T. Exline. James' possessions included a sorrel mare and colt, three white cows, 13 hogs and a variety of household furniture and a family Bible and photographs. He also had a field of corn and 12 bushels of wheat, and was owed more than $228 in debts from John L. Hileman. His estate was advertised in the Van Wert Weekly Bulletin. Unfortunately, Hannah's fate is unknown. James' grave marker, seen here in August 2002, is badly faded but still legible. The former church building beside the property is now a private residence. Although he never knew her, Susie was remembered by her nephew, Allen Edward Harbaugh, in his landmark history of the family written in 1913 -- Sketch of Minerd Families - Historical and Traditional. The history was read aloud at the Minerds' first annual reunion, at Ohiopyle, PA. In addition to Knights to Remember, James is mentioned in the Coopriders' 1947 book, Harbaugh History. Son Jacob Knight (1858-1929) married Lunetta Dague. Jacob died at age 75 in November 1929 at the home of daughter Mrs. G.C. Kampf in Van Wert. Daughter Bernice Bolenbaugh was featured in an article in the Van Wert Times Bulletin when she celebrated her 92nd birthday in March 1974. At the conclusion of the services Arthur Reed, undertaker, was making ready to leave for the cemetery, but had taken the lid off the casket to enable friends to view the remains. Then Mrs. Agler was led up to take a last look at her departed husband, when suddenly she was prostrated from grief. Mr. Reed caught her as she was sinking to the floor and she died in his arms. She was about 45 years of age. The burial of the husband was postponed until Tuesday when a double funeral took place, the processing with two hearses passing through Van Wert. Daughter Susan Knight (born 1850) married Thomas Llewellyn. Daughter Sarah Knight (born 1850) married Elias "Eli" Humrickhouse (1848-1937). They had five children -- Dallas "Dell" Humerickhouse (1871-1953), Anna (Humerickhouse) Ireland Chidester (1871-1948), John Humerickhouse (1877-1934), William Sherman Humerickhouse (1881- ? ) and Lydia Humerickhouse (1883- ? ). The fates of Obiah (born 1847) and Marion (born 1853) are lost to history.